Thinkport offers a wide selection of classroom tools and organizers, which work for many subject areas. These handy tools support students' digital skills as well as providing content-area instruction. Browse through Thinkport's collection of graphic organizers. Choose from a Venn diagram (seen on the left), a character map, a timeline and many more. Download the organizer as a Word document and help your students outline their thoughts. Use Thinkport’s Annotator tool to analyze text and build writing skills. Simply paste in your text, select your virtual markers and have students annotate the passages. Students submit their work and receive your feedback—virtually. A lesson builder, a quiz maker, a storyboad creator, and a puzzle builder. 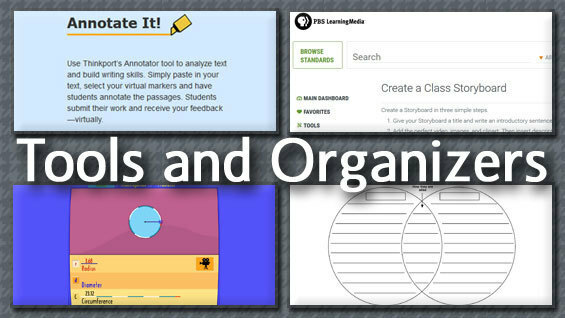 These tools from PBS LearningMedia make it easy to create engaging student assignments, personalize learning, and track student progress. Mathlanding, the elmentary math portal, offers tools that allow students to manipulate math objects and understand math concepts. Mathlanding also offers tools to help teachers enhance their professional development. 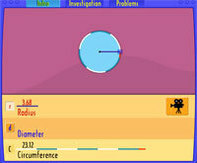 On the right is the Circle Tool, contributed to Mathlanding by the National Council of Teachers of Mathematics. Explore more resources for PreK-12 educators and early childhood providers at thinkport.org.